This commercial gallery’s site by Zak Group revolutionizes its place in the art dealing industry. Founded in 1996 by art dealer Timothy Taylor, the London- and New York–based Timothy Taylor gallery breaks the mold of the typically exclusive gallery business model with digital inventory systems, an extensive digital presence online and on social media, and transparent pricing. Designed and developed by London-based creative firm Zak Group, the gallery’s site reflects a new branding system and digital ethos. 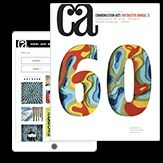 By creating a custom integration with Artlogic—a database specifically designed for curators—Zak Group’s site design enables Timothy Taylor to manage and publish work to the site from a single repository, which also contains extensive information for each work of art—including location, previous ownership and shipping. For the publishing company’s bicentennial, Cloudred made a site that celebrates 200 great HarperCollins titles. For this New York City–based architectural firm, Type/Code and Pentagram created an elegant, horizontally oriented site. Hello Monday created a site with an emphasis on longevity for this 100-year art project.